Yard waste stickers and yard debris tags are used to divert yard waste from landfills in states with yard waste disposal restrictions. 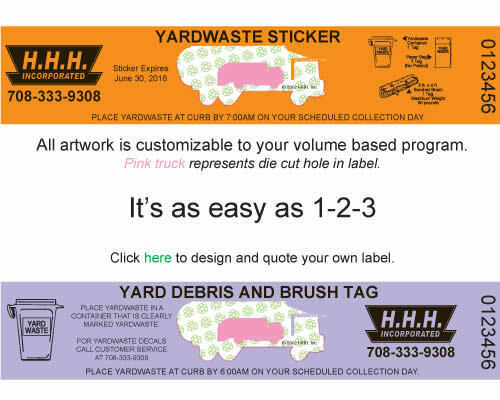 We can tailor these stickers to your city or town's yard waste program. Often our customers will ask us to place clip art for yard waste instructions on the back of the labels. Since the labels come in 5 up label sheets it is possible to use the entire back of the label sheet to convey your program's requirements and not have the text be the same text on the back of every sticker. Stop Label Counterfeiters Tip - Add expiration dates to your stickers and change label colors each year. Do not use white labels in your volume based programs. Label stock is sold in white and white labels make counterfeiting stickers easier.